The Red Hawks scored early in the first quarter against the DeWitt Panthers, but lost the game 36-12. Photo by K&R LaLone. 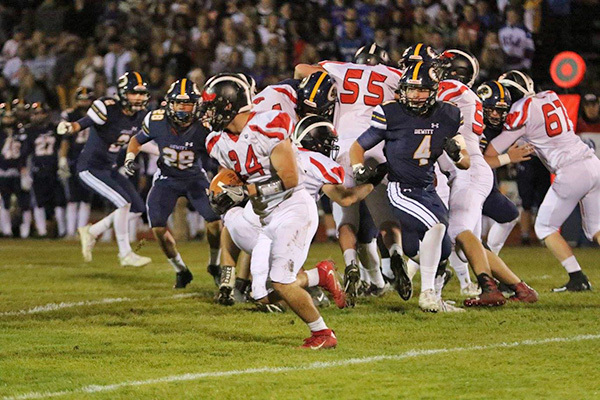 On Friday, November 3, in the city of DeWitt, Michigan, the Cedar Springs varsity Red Hawks faced off against the Panthers of DeWiitt, in their second round playoff game for the district chamionship. With a final game score of Cedar Springs 12, DeWitt 36, the Red Hawk boys of fall brought their season to a close. They finished with a record of 5-1 in conference play (2nd place in the OK-White) and 7-4 overall. With touchdowns scored in the first and third quarter, the Red Hawks left the stage to their opponents, but put up a tough fight throughout the game’s entirety. The first Red Hawk touchdown, and the first touchdown of the night was scored by Cedar Springs running-back John Jacob Todd. Todd ran left for 32 yards. After his touchdown, he attempted a pass to teammate Jordan Lyon for a PAT (point after touchdown) that was incomplete. The Hawks’ second and last touchdown of the night was run in by Ryan Ringler in the third quarter with 4:29 seconds left to play in the quarter. This touchdown also followed an incomplete two-point conversion, which Todd attempted to run in. Panther players Noah Koenigsknecht, Jack Horn, Alan Smith, and Darron Weber scored for DeWitt throughout the night, with passes assisting these touchdowns thrown by Blake Gatfield and Anthony Joseph. In spite of their defeat, the varsity Red Hawks were greatly supported by the Cedar Springs community, who took great pride in how far their team had come in the 2017 season. The Cedar Springs High school filled three spirit buses, bringing students to fill the stands at DeWitt high school, nearly two hours away from our hometown. Although this game was a last for many seniors, it was only the beginning of the varsity journey for others. The future team of 2018 looks forward to what next season has in store. 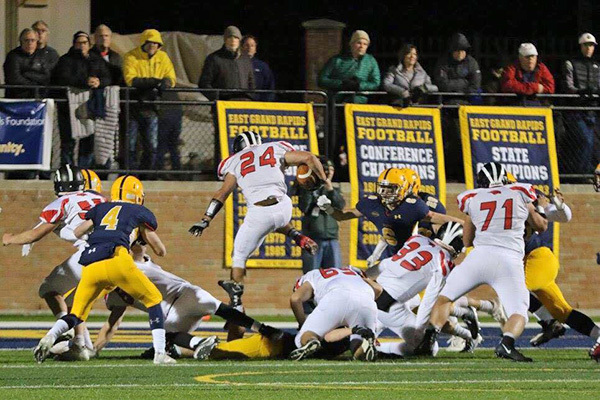 Red Hawk Ryan Ringler leaps over several Pioneers as he scores a touchdown. Photo by K&R LaLone photography. 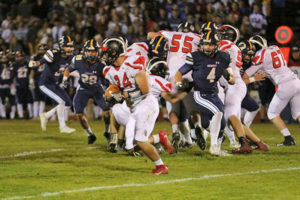 Before last Friday evening, October 24, the Cedar Springs Red Hawks Varsity Football team had only played the East Grand Rapids Pioneers a handful of times—four times to be exact, and none were wins for the Red Hawks. Two of those games were play off games. As a matter of fact, the last time Cedar Springs faced them was 10 years ago, in 2007. It was also a pre-district game at East Grand Rapids, and the Pioneers went on to win the state championship. But the Red Hawks turned up the heat Friday night, and gave the Pioneers (who were undefeated) a run for their money with a 41-40 win. And now the Red Hawks will face DeWitt in the district final on Friday, November 3, at 7 p.m. at DeWitt. Read more here. There is even more to celebrate than the Varsity football team, and Cedar Springs High School invites everyone to come out for a community pep rally tonight (Thursday, November 2) at 8 p.m. at Red Hawk Stadium. They will celebrate band and cross country going to state, and other great things going on. The event is free. Come on out and show your spirit! UPDATE: from Cedar Springs Public Schools… The Community Pep Rally for tonight has been moved from the Red Hawk Stadium to the Cedar Springs High School gym due to the weather. A Howard City Police investigation has helped put a sexual predator from out-of-state behind bars. According to Howard City Police Chief Steve DeWitt, they received a complaint from a township resident in January 2012 that her underage daughter was receiving explicit text messages from an unknown subject. Messages were over 100-200 in number. He said the messages were aggressive and sexual in nature, with the suspect attempting to gather personal information from the victim and photos. “It is believed the suspect obtained personal information of the girl from a social media website to initiate the contact,” explained DeWitt. The Howard City Police began an in-depth investigation that crossed state lines and led to a suspect in Bowling Green, Missouri. A search warrant executed by HCPD revealed evidence leading to the suspect. Working in conjunction with the Bowling Green Police Department, a suspect was identified and arrested. DeWitt said other out of state Police Departments also received similar complaints. The man, Jeffrey Glen Silvey, 33, pled guilty Monday to felony harassment last month for sending sexually provocative messages to an underage girl for just over a year. He was sentenced to three years in prison. He is also awaiting trial on charges in a separate case—six counts of child molestation and two counts of sexual misconduct for alleged sexual acts with a 10-year-old girl. Howard City Police sent out an alert to residents Monday about some suspicious incidents last week, where a couple approached businesses or individuals and asked for money. According to Howard City Police Chief Steve DeWitt, the incidents occurred at least three times last week. Each time, a couple asked for money to “fix the heater in their truck.” He said one incident was near a dollar store in Howard City, after the suspects observed the caller at the ATM machine. In the second incident, they went into a local business with the same story, and the third time was at the truck Stop on M46. Two different vehicles are reportedly involved. One is a dark blue or royal blue late 80s or early 90s Ford Ranger (maybe a S-10) pickup truck with a topper. The second is a red, early 90s Jeep Cherokee. License plates on both vehicles were covered in snow. In all three incidents, the couple asking for money included a female in her early 20s and a male subject. On a third occasion, a second male was also in the vehicle. The couple may have also been doing the same thing here in Cedar Springs. After we posted this alert on our Facebook page, a reader said he had also seen this couple at Family Fare, with the Ford Ranger. They told him they were from Mount Pleasant. When they asked for money, he sent them inside to use the phone. DeWitt said he thinks he knows who the people are, and they are not from Mount Pleasant, but Howard City. “It is not illegal to panhandle for money, however the activities are suspicious and we would like to speak to the subjects involved,” he explained. Cedar Springs Police Chief Roger Parent said that with the new state law allowing panhandling, there is not much police can do. “If they are on private property, a business would need to call us with a complaint for us to tell them to leave,” he explained. My name is Michelle DeWitt. I’m the mother of two kids. My oldest, Easton, is a 9 year old boy who has considered all dirt bike riders his role model, next to his Dad, since he was 2 years old. He has developed a love for racing and hopes one day to compete in freestyle events. Easton has only one other passion that comes close to his love for dirt bikes, the battle against Mitochondrial Disease. His baby sister, Payton, who is now 5 years old, was diagnosed at 18 months with this horrendous disease. Mitochondrial Disease is a deficiency in the body’s ability to form energy leaving all other organs and life supporting functions to suffer. It preys on adults with later onset, but it also preys on innocent children forcing their lives to be hindered by this monster. Symptoms range in severity from mild to fatal. There is no treatment, no cure and minimal research is being completed due to lack of funding. There is only care, comfort and maintenance for the patient. Payton’s Race for a Cure is a non-profit organization that’s mission is to support advocacy, awareness and ultimately a cure for Mitochondrial Disease. On October 1, 2011 the third annual Payton’s Race for a Cure will take place. We are very pleased to announce that we were able to raise $10,000.00 and donate this whole amount to the United Mitochondrial Disease Foundation (www.UMDF.org) and MitoAction (www.mitoaction.org) in 2010. This year we expect to greatly exceed this amount, with helpful sponsors such as you. Please join us on October 1 at Grattan Raceway in Belding for the 3rd annual Payton’s Race for a cure. Riders will sign in at 8 a.m. and activities begin at 11 a.m. There will be dirt bike practice, kids activities, food concessions, 50/50 and much more! For more info, go to paytonsraceforacure.com.